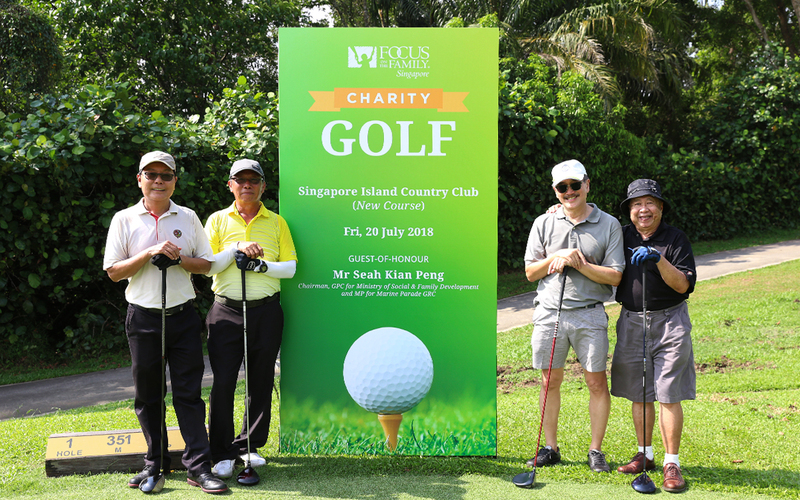 Focus on the Family Singapore held its 5th Charity Golf tournament on the lush greens of the Singapore Island Country Club on 20 July 2018. Some 133 golfers gathered to hit a hole-in-one for families, including Guest-of-Honour Mr Seah Kian Peng, CEO of NTUC FairPrice Foundation. Everyone had a wonderful time on and off the course, and over $200,000 was raised for the charity. The funds will be used to support the charity’s family-centred campaigns such as Date with Dad, FamChamps, and Create with Mum. While reconnecting with old friends and making new ones along the way, many guests also participated in a variety of games in good-spirited fun. Sponsored prizes worth over S$36,000 were given away including 2 sets of ASUS Vivobooks, along with Bee Cheng Hiang, Coach, and Eu Yan Sang merchandise, as well as hotel stays sponsored by Mandarin Orchard Singapore, Pan Pacific Singapore, PARKROYAL on Beach Road, and Far East Organisation among others. Focus on the Family Singapore would like to thank all prize sponsors such as Hole-In-One Sponsor, Daimler South East Asia, for their generous sponsorship. Focus on the Family Singapore is also thankful for all who supported and took part in the event. It was truly a day of investing in the future of Singapore families on the green.